Why do some adults with PiMZ α1-antitrypsin develop bronchiectasis? Bronchiectasis is an aetiologically heterogeneous, chronic and often progressive disease resulting in the permanent dilatation of one or more bronchi or bronchioli. Several reports indicated an association among inherited α1-antitrypsin deficiency (α1-ATD), pulmonary infections and bronchiectasis, with a frequency up to 10% [1, 2]. It has been postulated that in α1-ATD individuals repeated episodes of ordinary bronchitis, of whatever cause, may lead to the development of bronchiectasis . Most reported α1-ATD cases with bronchiectasis are elderly homozygous PiZZ (Glu342Lys) smokers with emphysema. There are only a few historical case reports with bronchiectasis and α1-ATD in the absence of emphysema [4, 5]. Whether there is an increased risk of pulmonary diseases, including bronchiectasis, in heterozygous PiMZ α1-ATD carriers is a matter of debate [6, 7]. We describe an 18-year-old, nonsmoking male who had neonatal hyperbilirubinemia and had suffered from productive cough, chronic rhinosinusitis and recurrent otitis since early childhood. During paediatric care an atypical form of primary ciliary dyskinesia was suspected, despite normal levels of exhaled nasal nitric oxide and unremarkable high-speed video microscopy analysis and transmission electron microscopy of nasal brush biopsies. Shortly after his 18th birthday, the patient was transferred from the paediatric to the adult bronchiectasis clinic. Initially the patient complained about mild unproductive cough and reported no limitation on physical exertion. He received long-term suppressive antibacterial therapy with co-trimoxazole due to chronic bronchial infection with Staphylococcus aureus. Pulmonary function testing (PFT) showed a moderate airflow obstruction (forced expiratory volume in 1 s 69% predicted and a Tiffeneau–Pinelli index of 0.59) and hyperinflation (residual volume/total lung capacity 141% predicted), with a moderate respiratory failure and hyperventilation (arterial oxygen tension 60.3 mmHg, arterial carbon dioxide tension 33.1 mmHg, pH 7.43). A high-resolution computed tomography scan of the chest revealed bronchiectasis in both lower lobes with thickening of bronchial walls and additional tree-in-bud sign, indicating bronchiolitis and mucus plugging, but no emphysema (figure 1a). Sputum cultures confirmed chronic S. aureus infection and excluded other relevant mycobacterial infection. Cystic fibrosis (including genetic testing), immunodeficiency and autoimmune diseases were excluded during the comprehensive workup of bronchiectasis aetiology according to guidelines for non-cystic fibrosis bronchiectasis . Abdominal ultrasound showed no signs of chronic liver damage. Laboratory tests showed normal leukocyte and lymphocyte values, normal percentage and absolute values for T-cells (CD4+ and CD8+), natural killer cells (CD 16+) and B-cells (CD19+). Characterisation of neutrophils and MZ α1-antitrypsin (α1-AT) protein isolated from a PiMZ patient with bronchiectasis. a) High-resolution computed tomography scan of the chest. Image shows bronchiectasis in both lower lobes. b) Characterisation of blood purified PiMZ neutrophil morphology. Cells were deposited onto slides using a Cytospin 3 cytocentrifuge (ThermoFisher Scientific, Waltham, MA, USA), stained with May–Grünwald Giemsa and analysed by light microscopy. Neutrophils had typical features with appropriate diameter, light blue grey cytoplasm and multi-lobed nucleus. c, d) Molecular profiling of α1-AT proteins. Equal amounts of α1-AT (Zemaira; CSL Behring, Kankakee, IL, USA) and affinity purified MM and MZ A1AT proteins were analysed on 7.5% SDS-PAGE followed by Western blotting. Total α1-AT and polymers of α1-AT were detected using rabbit polyclonal anti-human α1-AT antibody (dilution of 1:1000) and mouse monoclonal antibody against human α1-AT polymers (2C1, dilution of 1:700). Polymeric forms of MM and MZ α1-AT were detected with 2C1 antibody. e–g) Gene expression profiling of purified neutrophils. Neutrophils from three PiMM donors and a PiMZ patient were incubated alone or with 20 ng·mL−1 of lipopolysaccharide (LPS) for 5 h. e and f) Independent of the experimental conditions, PiMZ neutrophils showed lower SERPINA1 and higher ELANE expression relative to PiMM neutrophils. g) In response to LPS, the expression of tumour necrosis factor (TNF)-α was very low whereas interleukin (IL)-1β was twice as higher in PiMZ than PiMM neutrophils. Bars represent the mean±sd of three independent experiments, each with four repeats for PiMM neutrophils, and one experiment with six repeats for PiMZ neutrophils. h and i) Effects of purified MM and MZ α1-AT on peripheral blood mononuclear cells. Cells were treated with LPS (100 ng·mL−1) alone or in combination with α1-AT (0.5 mg·mL−1) proteins. When compared to MM, MZ α1-AT showed significantly lower inhibitory effect on LPS-induced TNF-α and IL-1β expression. Each bar represents mean±sd of three independent repeats. Significance was considered at >0.05. To our surprise, analysis of the serum α1-AT concentration (by nephelometry) and phenotyping (by isoelectric focusing) revealed that the patient had reduced α1-AT levels of 0.78 g·L−1 (normal range 0.9–2.0 g·L−1) associated with an intermediate PiMZ α1-ATD. After confirmation of α1-ATD, a treatment regimen was started consisting of salbutamol and nebulised hypertonic saline prior to chest physiotherapy, maintenance treatment with a macrolide such as azithromycin (250 mg three times a week), tiotropium for inhalation and a topical nasal steroid after upper airway clearance. After another month the patient's condition was stable and PFT had normalised. The patient discontinued chest physiotherapy but performed physical exercise five times per week. We currently do not consider our PiMZ patient as a candidate for the substitution treatment with α1-AT. However, this may become a treatment option with disease progression. It is generally accepted that the PiMZ genotype only increases susceptibility to airways diseases in combination with smoking . However, the biological mechanism underlying this proposed link between smoking and PiMZ genotype is not yet understood. The protease–antiprotease imbalance is a likely cause for the development of α1-ATD-related emphysema and bronchiectasis. Neutrophil dominated inflammation is typical of bronchiectasis and specific neutrophil degranulation products, including elastase, play a key role. For example, elastase can inhibit ciliary beat frequency, damage epithelia and inhibit opsonophagocytosis. All of these effects of elastase contribute to persistence of bacteria in the respiratory tract and to long-term tissue damage. Besides release of elastase and other degranulation products, it is now recognised as a more complex repertoire of activated neutrophil responses, including expression of various cytokines (interleukin (IL)-β and tumour necrosis factor (TNF)-α, among others) and A1AT, a major endogenous inhibitor of neutrophil elastase . α1-AT accounts for most of the anti-elastase activity in the alveoli . There are no known differences in α1-AT, elastase and cytokine (IL-β and TNF-α) transcription between MZ- and MM-type neutrophils. To elucidate a possible link between PiMZ α1-ATD and bronchiectasis, we asked whether blood neutrophils and α1-AT protein isolated from our PiMZ bronchiectasis patient differ from healthy PiMM donors. Neutrophils (98% purity) were isolated from freshly obtained peripheral blood from the PiMZ patient and three healthy PiMM donors (mean age 25 years) using gradient centrifugation . The patient provided written informed consent for the experiments to be performed and for this article to be published. Cells (5×106·mL-1) were incubated in RPMI-1640 medium with and without 20 ng·mL−1 lipopolysaccharide (LPS) for 5 h, at 37°C, 0.5% CO2. Quantitative real time-PCR of elastase (ELANE) and α1-AT (SERPINA1) genes was performed using designed primers and specific fluorescent labelled TaqMan probes (Universal ProbeLibrary; Roche Diagnostics Deutschland GmbH, Mannheim, Germany). ELANE primers: EN_F: 5′TTCCTCGCCTGTGTCCTG3′ and EN_R: 5′CTGCAGGGACACCATGAA3′ with probe #3; SERPINA1 primers: AAT_1A_F: 5′TGAGGAGAGCAGGAAAGGACA3′ and AAT_1A_R: 5′CTCAGCCAGGGAGAC AGG3′ with probe #18. cDNA samples were diluted 1/10 and amplified using TaqMan advance master mix in a 7500 Fast Real Time PCR System (Thermo Fisher Scientific, Waltham, CA, USA) with recommended PCR cycle conditions. GUSB was used as an endogenous control gene. In addition, expression of IL-β, TNF-α and GAPDH (control gene) were determined using TaqMan Gene Expression Assays on a Step One Plus real time PCR machine (Thermo Fisher Scientific). The primers were purchased from Thermo Fisher Scientific. Experiments were performed in triplicate and relative expression was calculated by using the comparative Ct method to obtain the fold-change value (ΔΔCt). An inter-plate calibration sample was used to compare samples analysed in different PCR plates. Microscopic examination of May–Grünwald Giemsa-stained cytospins revealed normal appearance of PiMZ neutrophils (figure 1b). As expected, affinity purified MZ α1-AT protein contained a mixture of polymeric forms (figure 1c and d). At a baseline, PiMZ neutrophils showed significantly lower SERPINA1 but higher ELANE expression when compared to PiMM neutrophils (figure 1e and f). In response to LPS, PiMZ neutrophils also showed lower expression of SERPINA1 (by 3.5-fold, p<0.001) but higher expression of ELANE (by 4-fold, p=0.043) than PiMM neutrophils. Concomitantly, LPS-treated PiMZ neutrophils expressed significantly higher levels of IL-1β than PiMM neutrophils (figure 1g). PiMZ neutrophils seem to have dysregulated mRNA levels for elastase and its inhibitor and in response to inflammatory stimuli PiMZ neutrophils expressed more elastase and IL-1β and less α1-AT than PiMM neutrophils. The excess of elastase over α1-AT in the activated neutrophils of PiMZ patients may depress levels of the naturally occurring inhibitor and thereby be an important contributor to bronchiectasis development. 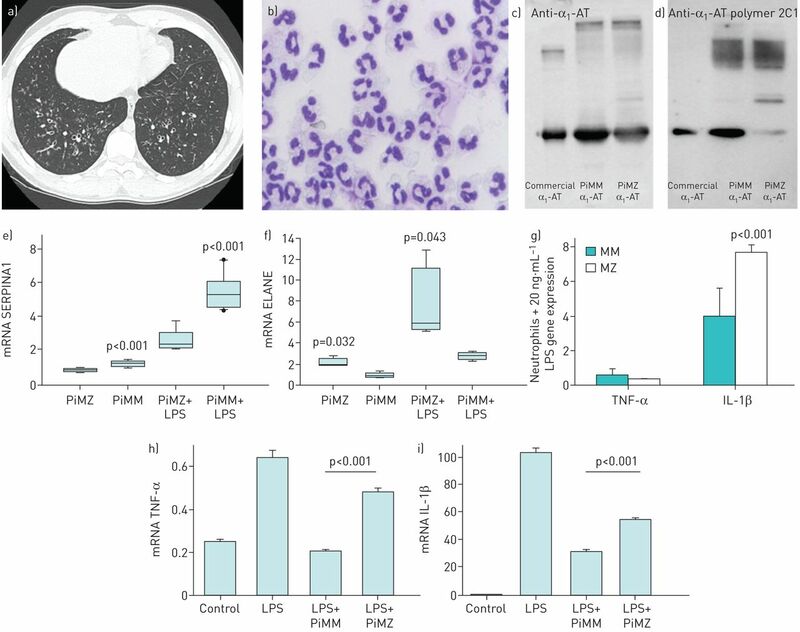 During high neutrophilic inflammation, serine proteases, such as elastase, can activate the pro-cytokine forms of IL-1β and TNFα, which will subsequently activate neutrophils and other cells of the immune system and contribute to the prolonged neutrophilic inflammation in the lungs. Future studies are needed to delineate whether the expression pattern of proteases and inhibitors and pro- and anti-inflammatory cytokine expression in general differ between neutrophils of people with normal and deficient variants of α1-AT. Finally, we compared anti-inflammatory properties of purified MZ and MM α1-AT proteins in human adherent peripheral blood mononuclear cells in vitro. Isolated and cultured peripheral blood mononuclear cells  were treated for 24 h with 100 ng LPS alone or LPS plus 0.5 mg·mL−1 MM or MZ α1-AT. As shown in figure 1h and i, the ability of LPS to induce TNF-α and IL-1β expression was better inhibited by MM than MZ α1-AT. Hence, the PiMZ patient has not only lower levels of α1-AT but also a functionally compromised MZ α1-AT protein, which amplifies the clear imbalance between elastase and α1-AT. The anti-inflammatory and immunomodulatory role of α1-AT is becoming increasingly recognised . Therefore, the impaired functional activity of MZ protein probably contributed to immunological imbalance and increased susceptibility to early childhood rhinosinusitis and recurrent otitis in our PiMZ patient. Bronchiectasis is most often secondary to infections. For that reason, chronic infections and persistent inflammation most likely led to the development of bronchiectasis and chronic upper airway complaints. While Pseudomonas aeruginosa is recognised as the major pathogen, which is clearly associated with adverse outcomes , the relevance of chronic airway infection by S. aureus remains to be established among adult bronchiectasis patients. Our findings in a young patient highlight the quantitative and qualitative deficiency of MZ α1-AT and increased neutrophil expression of elastase mRNA, which offers an explanation for the early-age onset of bronchiectasis. Recently, Milger et al. also reported a case of α1-ATD presenting with severe cystic bronchiectasis and the absence of classical emphysema. Interestingly, this case had a novel mutation leading to a dysfunctional truncated α1-AT protein. These atypical cases with bronchiectasis highlight α1-AT as a differential diagnosis in bronchiectasis.
. Natural history and life expectancy in severe alpha1-antitrypsin deficiency, Pi Z. Acta Med Scand 1978; 204: 345–351.
. Chronic bronchitis: the antiproteinase/proteinase balance and the effect of infection and corticosteroids. Clin Chest Med 1988; 9: 643–656. Alpha1-antitrypsin deficiency with diffuse bronchiectasis and cirrhosis of the liver. Chest 1977; 71: 535–538. Bronchiectasis and homozygous alpha1-antitrypsin deficiency. Chest 1975; 67: 233–235. Chronic obstructive pulmonary disease in alpha1-antitrypsin PI MZ heterozygotes: a meta-analysis. Thorax 2004; 59: 843–849. Distribution of α1-antitrypsin alleles in patients with bronchiectasis. Chest 2000; 117: 415–419.
. British Thoracic Society guideline for non-CF bronchiectasis. Thorax 2010; 65: Suppl 1, i1–58. Interactions between SERPINA1 PiMZ genotype, occupational exposure and lung function decline. Occup Environ Med 2014; 71: 234–240. Alpha-1-antitrypsin is produced by human neutrophil granulocytes and their precursors and liberated during granule exocytosis. Eur J Haematol 2011; 86: 517–530. Acute-phase protein alpha1-antitrypsin inhibits neutrophil calpain I and induces random migration. Mol Med 2011; 17: 865–874. α1-antitrypsin combines with plasma fatty acids and induces angiopoietin-like protein 4 expression. J Immunol 2015; 195: 3605–3616.
. α1-antitrypsin: a polyfunctional protein? Lancet Respir Med 2015; 3: 341–343. Identification of a novel SERPINA-1 mutation causing alpha-1 antitrypsin deficiency in a patient with severe bronchiectasis and pulmonary embolism. Int J Chron Obstruct Pulmon Dis 2015; 10: 891–897. You are going to email the following Why do some adults with PiMZ α1-antitrypsin develop bronchiectasis?